In March 2016, the College Board offered the first administration of the redesigned SAT exam. Below are answers to some frequently asked questions from students about how the new SAT will impact the admission and scholarship process at John Carroll University. Will JCU accept results from either the old or the new SAT? Students applying for admission for the fall 2017 semester can submit scores from the old SAT, the new SAT, or both. Does JCU require the SAT Essay section? The old SAT had 3 required components, one of which was Writing. On the new SAT there is no longer a required writing component. There is an optional essay, and it is NOT required for admission to John Carroll. How will JCU superscore with the new SAT? Like many schools, John Carroll University superscores standardized test scores (for both SAT and ACT) – if a student takes the SAT multiple times and sends us multiple scores, we will take the applicant’s highest section scores across all SAT test dates that are submitted to create a new, potentially higher superscore. If we have multiple scores submitted, some from the old SAT and others from the new SAT, we will superscore across sittings of the old SAT OR the new SAT. Because scores on the new SAT are not equivalent to scores on the old SAT, we cannot superscore between old and new scores. How will the new SAT impact merit scholarships? 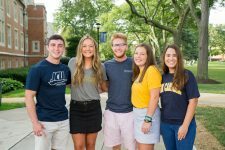 Students applying for freshman admission to John Carroll University are automatically considered for a merit scholarship (based on academic criteria including standardized test scores) during the application review process. Because scores on the new SAT are not equivalent to scores on the old SAT, the College Board has provided all colleges and universities with concordances which map how scores from the old SAT translate to scores from the new one. We are currently reviewing our merit scholarship ranges and criteria for students who will be applying for fall 2017. Both old and new SAT scores are acceptable and neither will carry more weight in the admission or scholarship process. Please refer to our scholarship website for the most current information.